Strong Authentication using Asymmetric Keys on Devices Controlled by You: This presentation is about the new authentication experiences enabled by the W3C Web Authentication (WebAuthn) and FIDO 2.0 Client To Authenticator Protocol (CTAP) specifications. It describes the progress being made on the standards and shows some example user experiences logging in using authenticators. Check it out in PowerPoint or PDF. Token Binding Standards and Applications: Securing what were previously bearer tokens: This presentation is about how data structures such as browser cookies, ID Tokens, and access tokens can be cryptographically bound to the TLS channels on which they are transported, making them no longer bearer tokens. 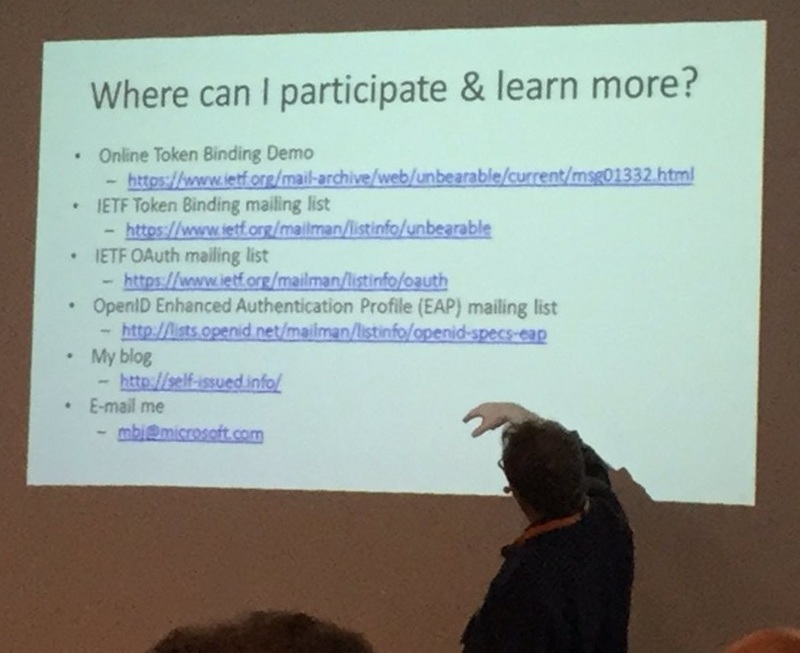 It describes the state of the Token Binding standards (IETF, OAuth, and OpenID) and provides data on implementations and deployments to date. This presentation was a collaboration with Brian Campbell of Ping Identity. Check it out in PowerPoint or PDF.